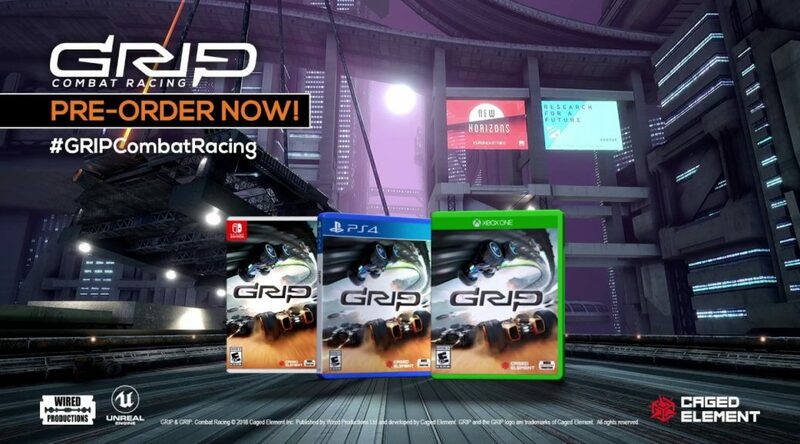 Wired Productions has announced the release date for GRIP: Combat Racing. The futuristic racing game launches November 6, 2018 at retail and eShop for Nintendo Switch. Customers who pre-order the game at GameStop will receive the exclusive Nyvoss Hex Paint Kit; the Vortex Rim Pack; and five pre-order exclusive vehicle decals. Wired Productions Ltd., a leading independent video games publisher, and developer Caged Element Inc. today announce that GRIP: Combat Racing – a ferociously fast, futuristic arcade combat racer – will speed onto the PlayStation®4 computer entertainment system, PlayStation 4 Pro, Xbox One, the all-in-one entertainment system from Microsoft, Xbox One X, Nintendo Switch™ and Windows PC via Steam® on November 6, 2018. Racers who pre-order through GameStop in the US will receive the exclusive Nyvoss Hex Paint Kit; the Vortex Rim Pack; and five pre-order exclusive vehicle decals. GRIP: Combat Racing will see racers hurtling their way around 22 breath-taking tracks across a variety of hostile and foreign worlds, driving one of 15 armored cars – some swift and agile, while others are brutish and heavily armored. Players must be merciless; deploying a bristling arsenal of 9 outlandish weapons and power-ups to give them the advantage to take the lead against other fierce competitors. These weapons will allow players to not only target other cars, but also the destructible environments surrounding them. Inspired by the Rollcage games of the late 90sand backed by a highly-skilled and accomplished team, which includes Rollcage programming veteran, Robert Baker, GRIP: Combat Racing celebrates the re-emergence of blindingly fast arcade combat racers, offering a true, wheel-gripping racing experience – where utter destruction serves one true purpose: be the first to cross the finish line. Taking full advantage of the current generation of gaming hardware – and benefiting from the potential that comes with building on Unreal® Engine 4, the game accelerates ahead of the racing crowd by offering players gravity-defying physics reaching speeds of over 767 mph – making it the fastest racing game on four wheels. Along with the breakneck speeds and intense action, players will generate countless unforgettable gaming moments – online or offline – with split- screen races and tournaments. Born of the age of street racing, and losing none of its cut-throat nature, it’s not enough to just cross the line in GRIP: Combat Racing; more important is how you got there and how much destruction you have unleashed upon your rivals along the way.